On Sunday, Fred, Jonelle and I set out with the intent of checking out the Hannegan Pass trail in advance of Thursday’s scheduled hike. On the way up I expressed skepticism that Hannegan would be sufficiently snow-free for anything more than a trip to the camp – perhaps we could get to the pass but I don’t really care to hike Hannegan unless there is at least a chance of making it to the peak. 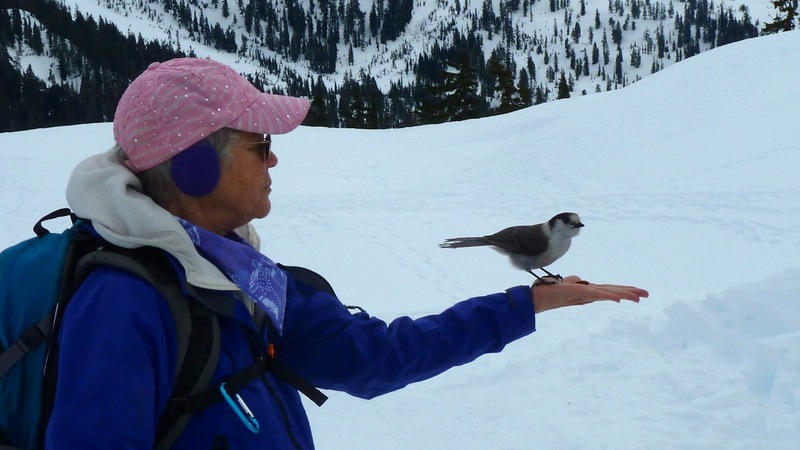 I had been thinking of Excelsior as a replacement, so we decided to go there instead – this would give the maximum total information since we could find out about the situation on Hannegan from Pat, who had taken the other Trailblazers’ group up there last Thursday. We were pleased to see not a trace of snow until we were well past where we’d reached on our earlier attempts this year. We hit the first significant snow on the trail at about 4600 feet, less than a mile from the pass; from there on the trail is about 50-60% snow-covered. 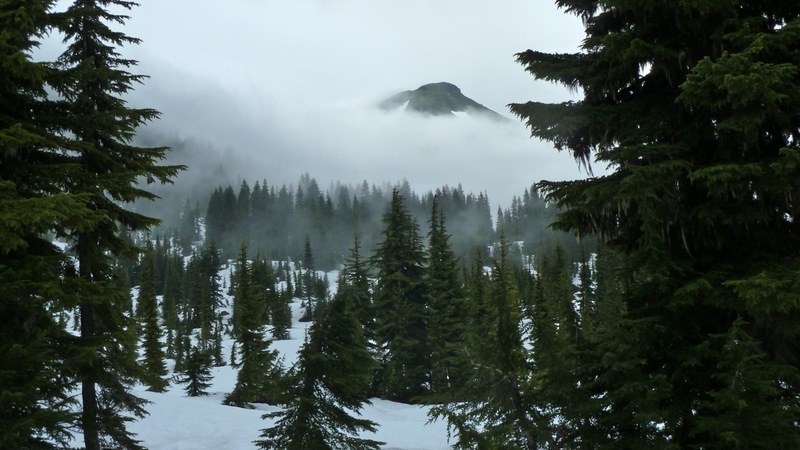 At first, under the canopy, the snow is dense and firm, with lots of small depressions to cradle your foot; as you enter the open meadow and begin to get views up toward the ridge, the snow is softer. Of course, walking in snow is always harder than bare ground but none of this is scary or difficult. Jonelle was on the Goat Mountain hike the week before last and felt that this was easier. 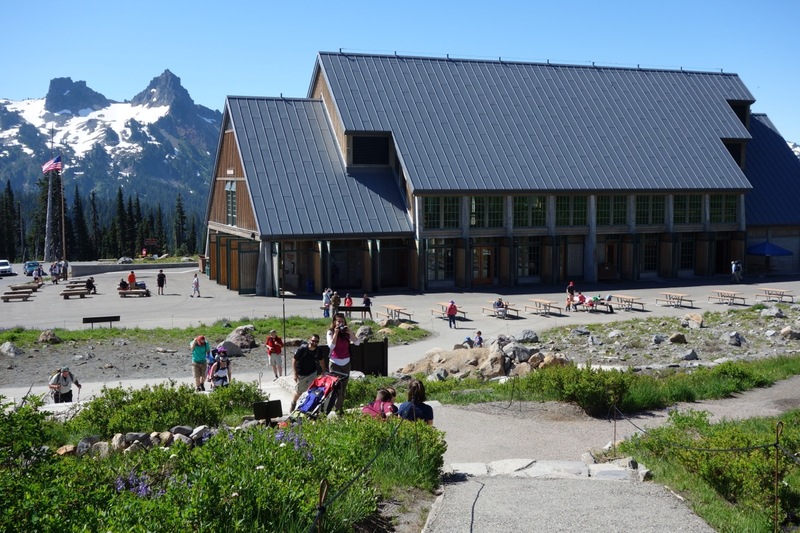 As you can see in the photos, the open meadows below the pass are largely melted out. 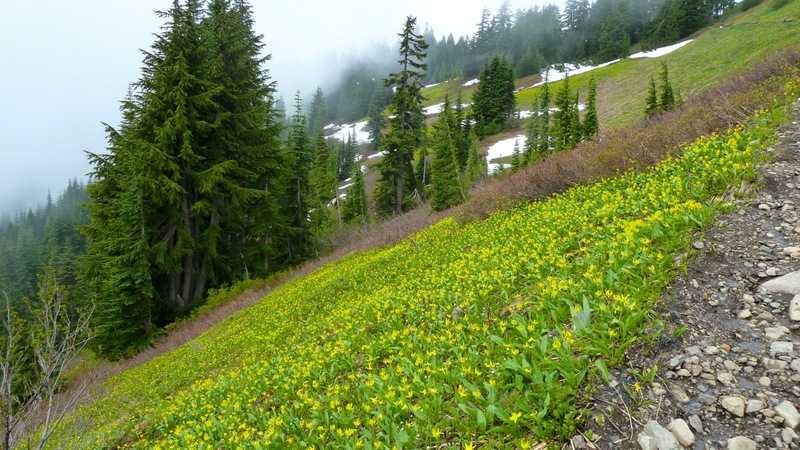 The photo on the right shows some of the wild abundance of glacier lilies along the trail – I don’t think I’ve ever seen so many. In that picture, way up in the upper right corner, you can see the trail as it approaches the last line of trees before the pass. 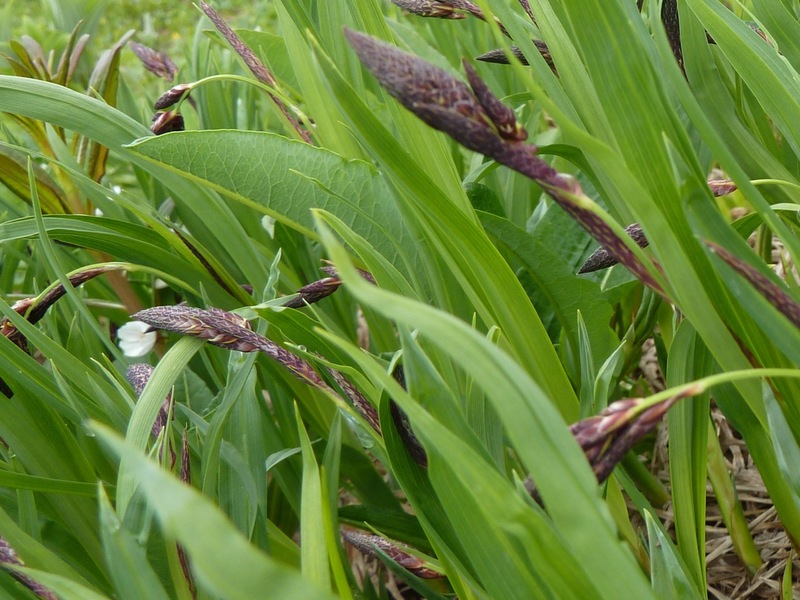 We also saw masses of these little grass-like plants tipped with blackish-purple spearheads about an inch long – I’m sure someone can tell me what they are. 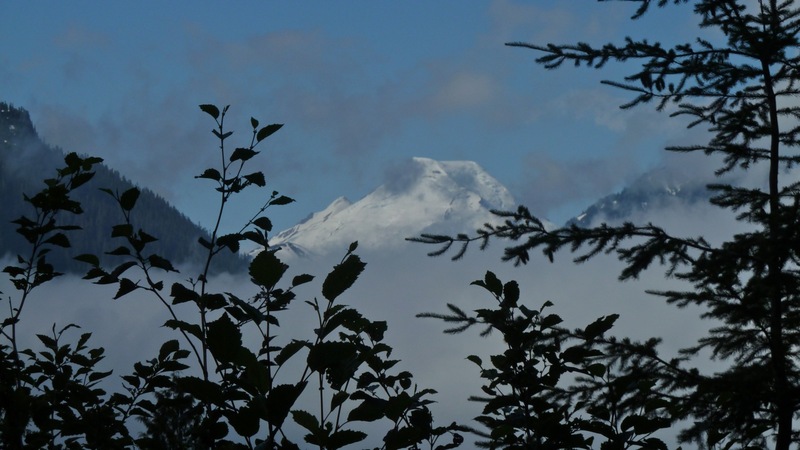 You can see that we were right at the level of the cloud ceiling, so there wasn’t much of a view, except for one little hole in the clouds that exposed a bit of Ptarmigan Ridge over on the NE corner of Mount Baker. 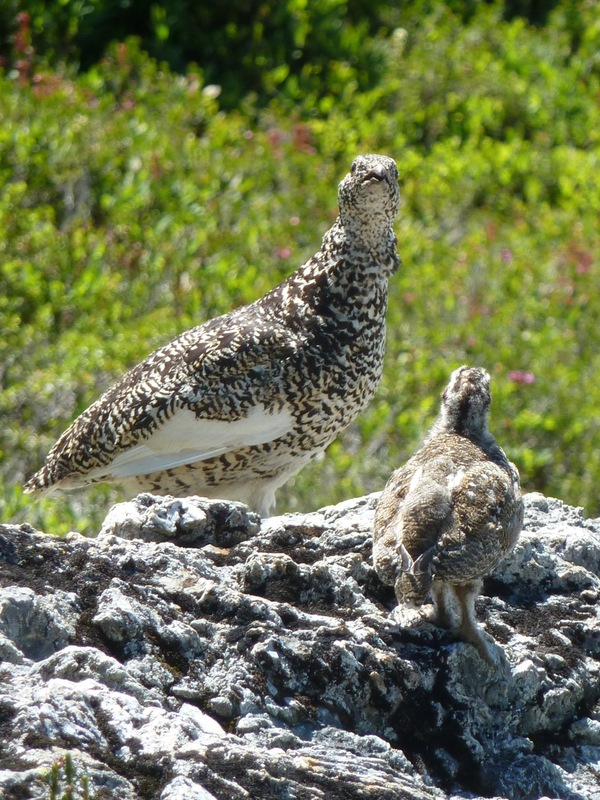 Thursday is forecast to be clear and cool, perfect weather both for hiking and for views. To show the scale of the snow issue, on the way back down I kept track on my GPS of the edges of the major tracts of snow and prepared this little map – the green is bare earth and the blue is snow-covered. 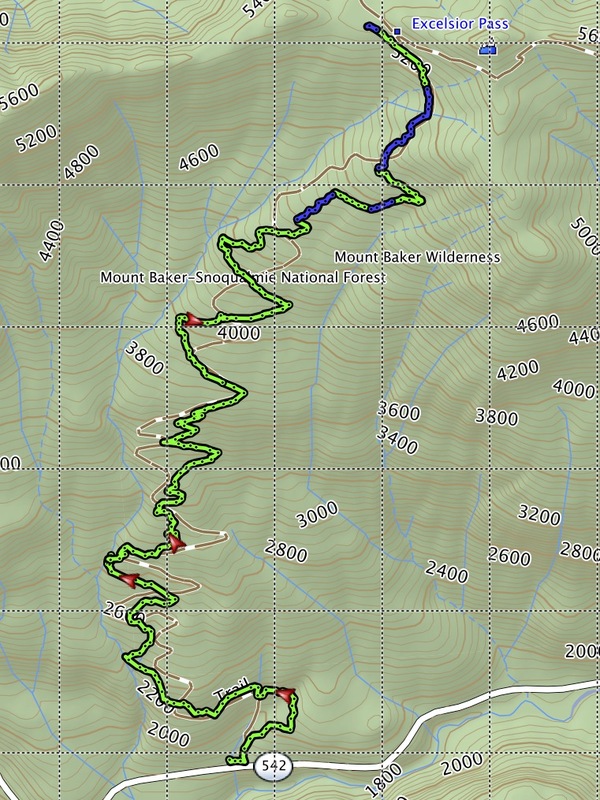 This is a long, steep hike (9 miles round trip and 3500′ of gain) and my main memory today is not of hiking in the snow. I joked to Jonelle that this hike is 4.5 miles on the way up but about 7.5 miles on the way back. 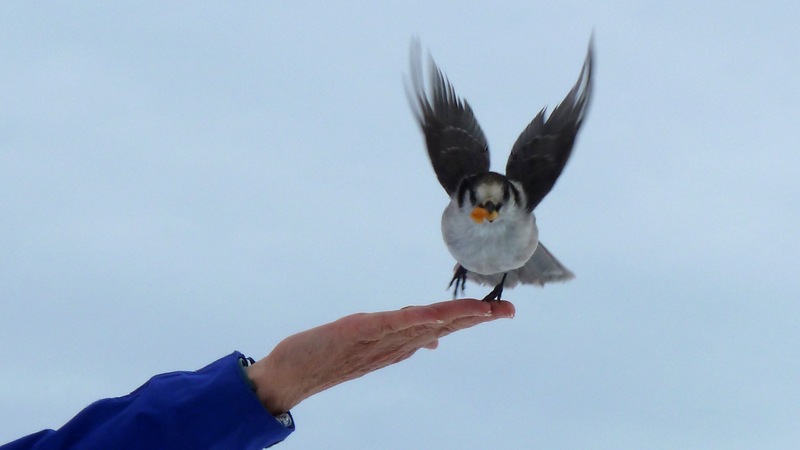 When we got to the car she disagreed – she thought is was only 7 miles down. 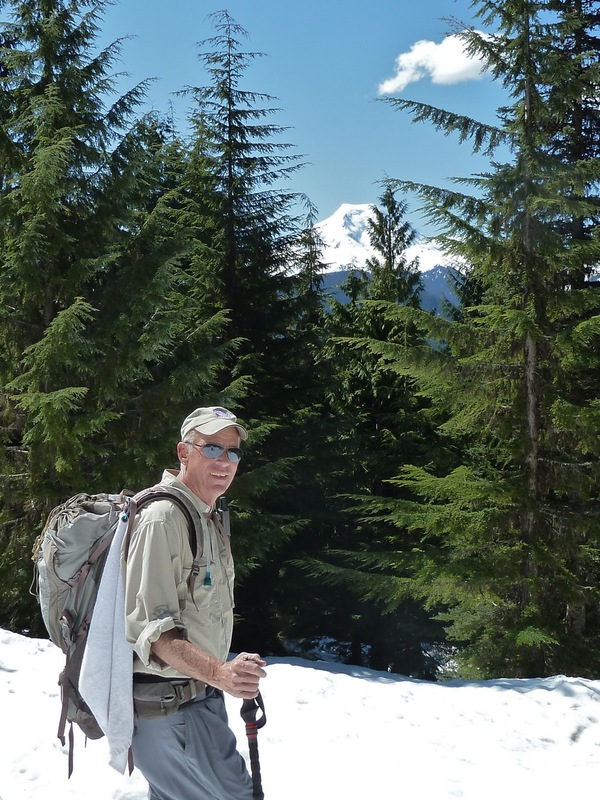 Today I talked to Pat and learned that they ran into snow on the Hannegan trail about a half-mile before the camp area. This would mean covering a mile or so of snow, including some steep side slopes, just to get to the pass (also a 4.5 mile hike). To my mind the choice is an easy one – Excelsior it is! On Sunday five stalwart hikers made our way up the Keep Cool trail to assess the snow conditions for this Thursday’s hike. (You can read more about this trail on an earlier post of mine.) 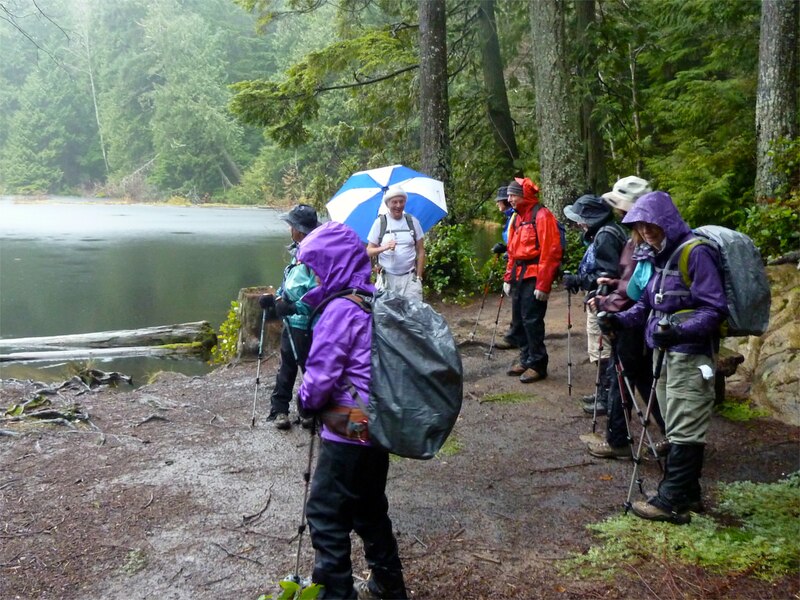 The weather forecasts have been bouncing all over the place for the last week, so our concerted efforts to find the best day for a hike managed to come up with just about the worst. We caught a couple of peeks at the mountains across the river in the first few minutes of the hike and tantalizing patches of blue sky appeared now and then. The sun even squeezed through the trees a few times. This trail is anything but boring. 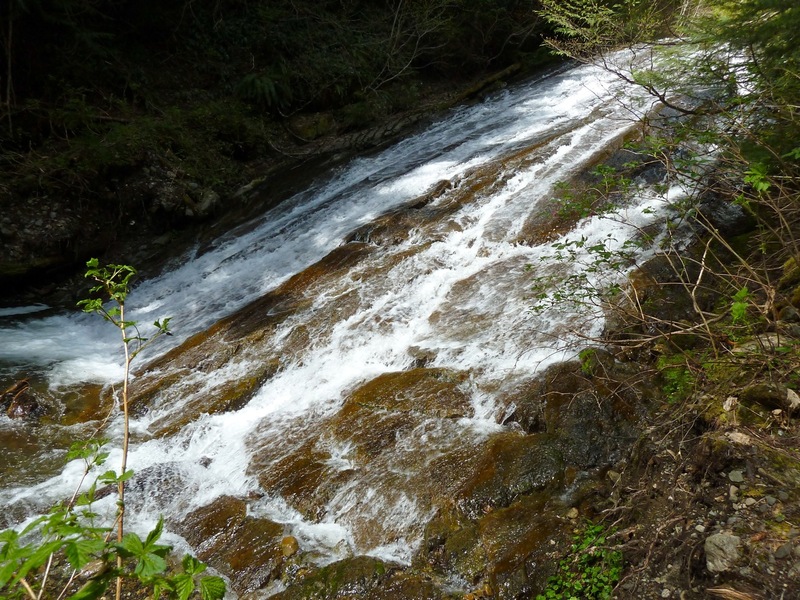 It starts out with the trail barely visible in brushy Alder thickets, gets very steep for awhile, levels out in at about 4000′, goes steeply up between two streams, flattens out in a wet meadow at 4750′, continues up a steep rocky slope. 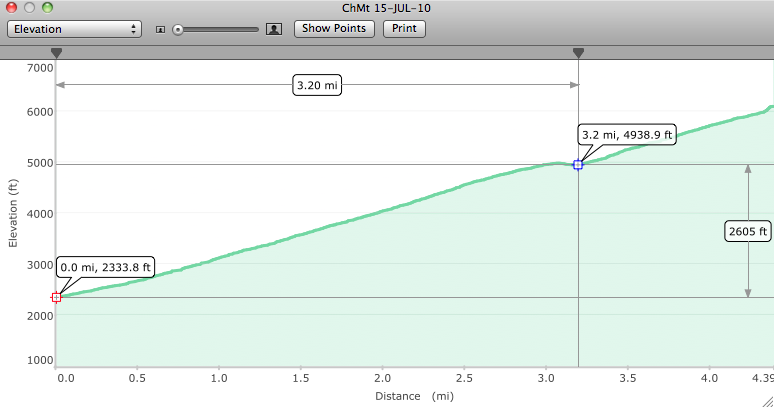 On the right is a profile of the trail taken from my GPS software. The line just looks a bit bumpy, but on the ground those changes in slope are huge. At any rate, the snow situation is pretty similar to last year at this time, perhaps a bit better. 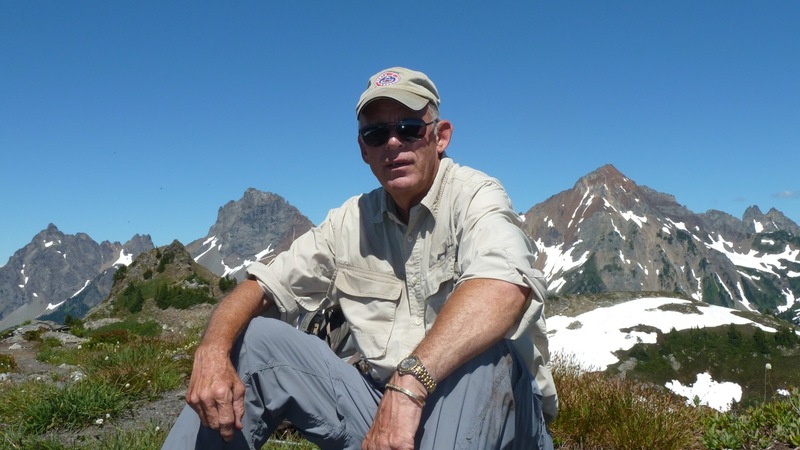 You can see more about last year on DJan’s blog, including a picture showing the summit of Yellow Aster Butte on hikes at the beginning and end of July, 2011. 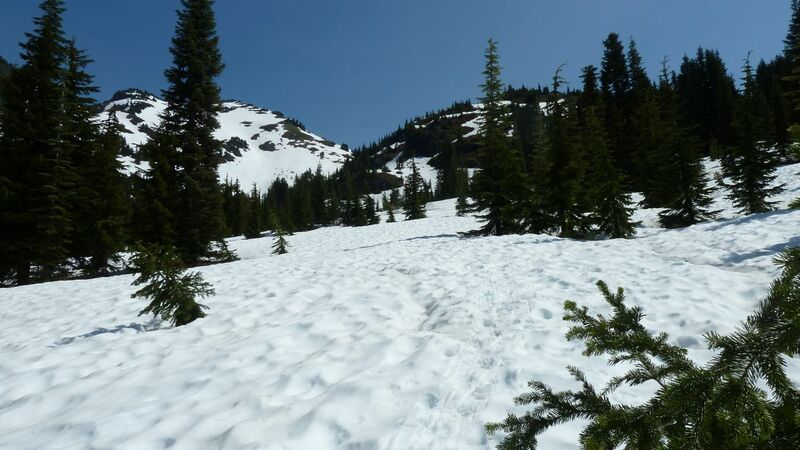 This time there was only a tiny bit of snow on the level section at 4000′ and no significant amount until shortly before the meadow, which is full of soft snow. Just as we got to the edge of that meadow there was a lot of blue sky above and the clouds parted in front of Yellow Aster Butte for just long enough for me to unholster my camera and grab a shot to compare with last year’s. 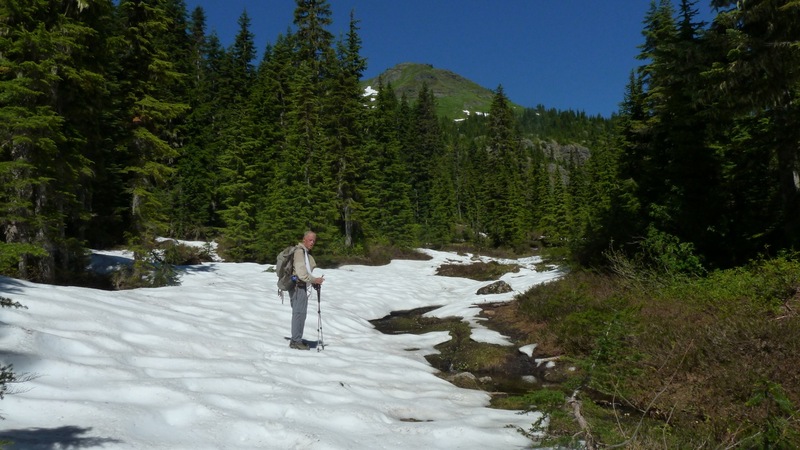 I would say that there is a bit less snow on this day (7/15) than there was on the second hike last year (7/25) but it is still roughly in the same ballpark. The blue sky lasted for about 30 seconds. 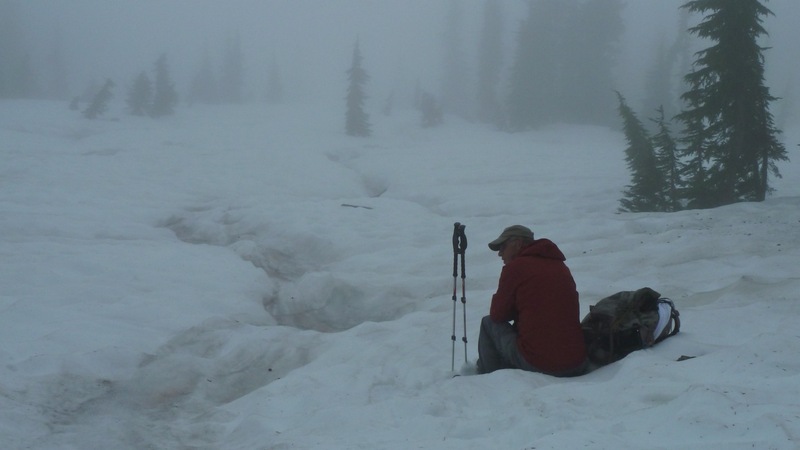 By the time we’d mushed across the meadow and settled down for lunch the conditions had reverted to something that has been all too familiar on this season’s hikes – eating lunch while hunkered down in a cloud. 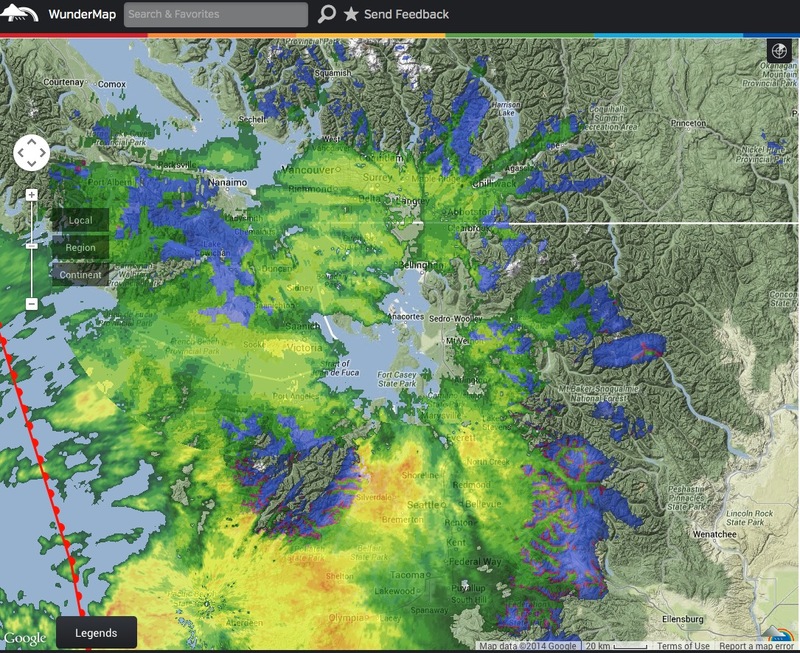 As we finished eating the fog got a little more aggressive and gradually changed to a light rain on the way down. It wasn’t enough to cause any real problem but just enough to remind us that this trail, which could (charitably) be called “challenging” and “interesting” on a dry day, is truly unpleasant in the rain. The steep sections, the struggling around or over downed timber and the Alder brush are all much worse when wet. So what’s up for Thursday? 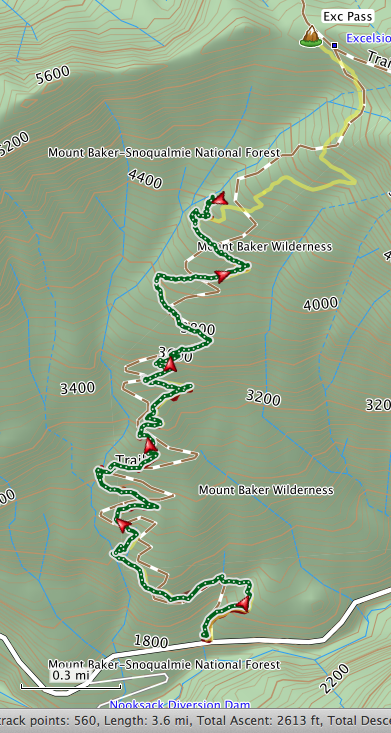 I think the Trailblazers could handle this hike this week if the weather were good. Of course, not everyone enjoys slogging through the snow as much as I do, so I might get some argument on that. 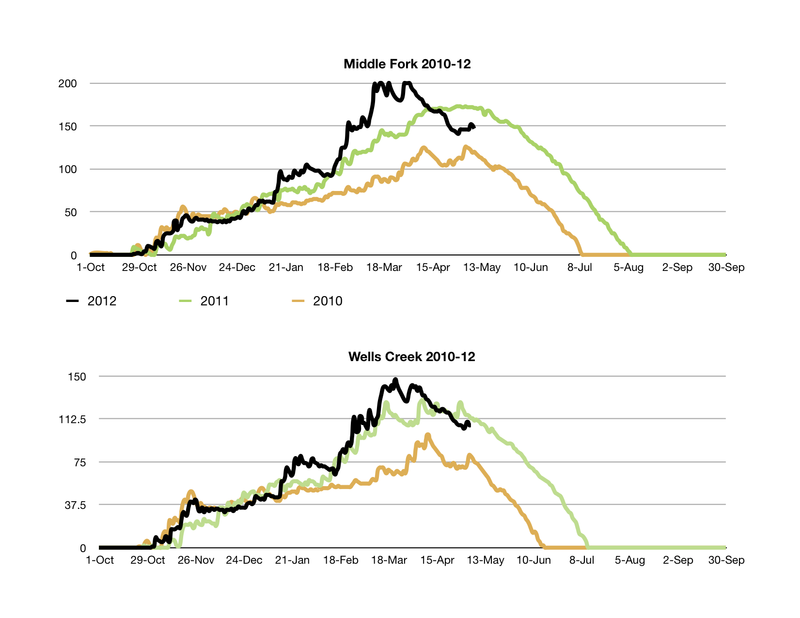 The recent spate of rapid melting does seem to be continuing, as evidenced by the rivers and streams running deep and brown and by the snow monitoring stations – the one at 5000′ just south of the town of Glacier has the snow depth at about 30 inches and dropping about five inches per day. So I lean toward doing Keep Cool this week but I wouldn’t touch it with a ten-foot pole if the weather is bad. Given the continuing unsettled state of the atmosphere it would seem prudent to plan on something with less of a down side. 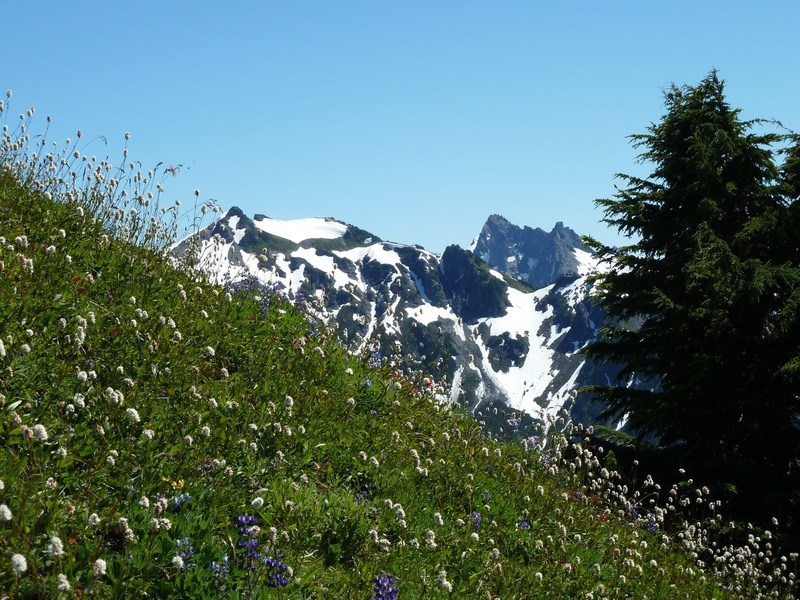 And the only one that comes to mind is a return to Church Mountain – it is a wide, well graded trail and we know from personal experience three weeks ago that the trail is snow-free to the meadows. 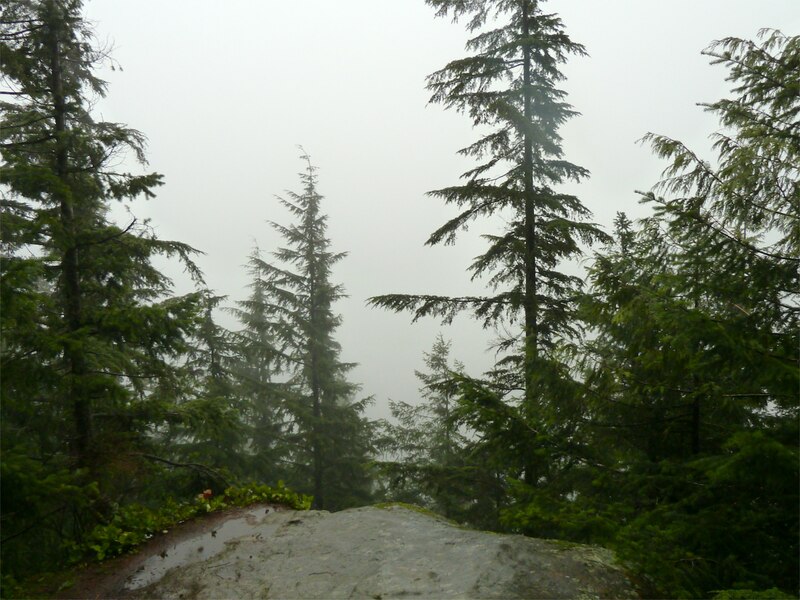 Even if the weather is bad we’d still get a good, safe workout with the possibility of terrific views if the clouds permit. On Saturday I hiked up the Goat Mountain trail to see if it would be reasonable choice for this Thursday’s hike, and the short answer is, “Yes!” As you can see from the picture above I made it to the ledge at 5100′ which gives the splendid views of Mounts Sefrit, Shuksan and Baker, among others. The snow in the foreground gives away the fact I had to travel across some of the white stuff to get there. 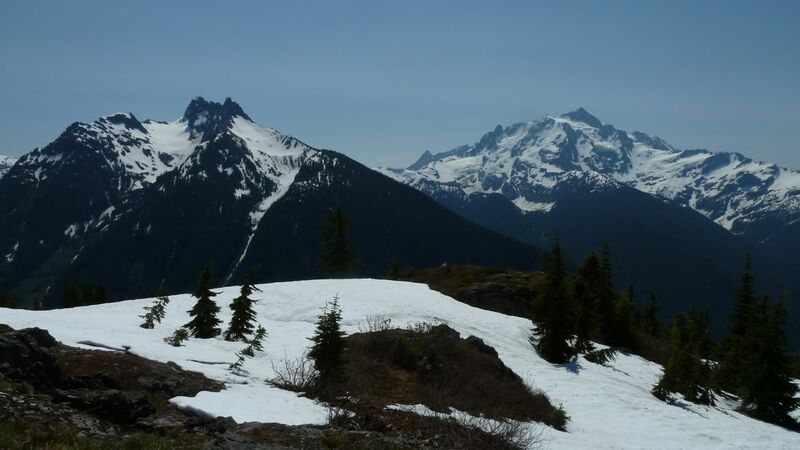 The trail is entirely free of snow as you climb up through the woods, with just a few small patches as you break out into the more open terrain and start to get views of Shuksan like the one at the left. 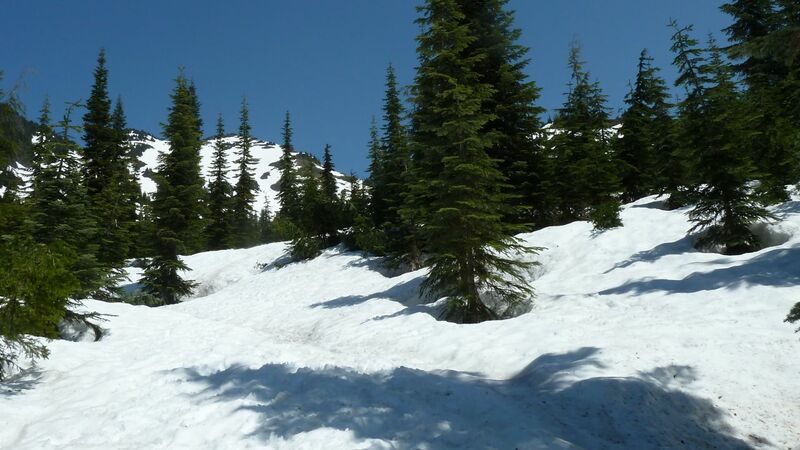 Then at 4600′ where the trail takes a sharp right turn uphill, giving the first sighting of the summit of Goat Mountain, the trail suddenly disappears under the snow, never to appear again. 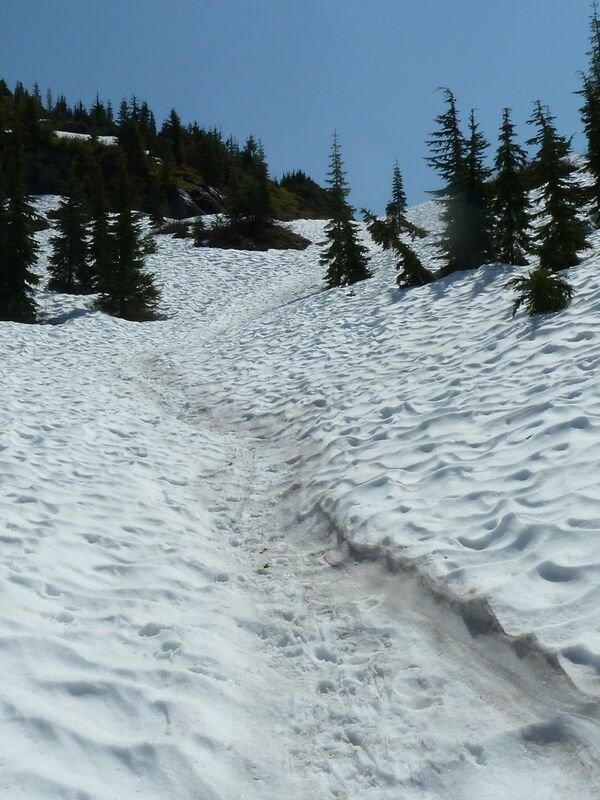 But the snow is fairly soft and there is a well-beaten track that leads to the ledge. It doesn’t follow the trail exactly but that may be an improvement – this part of the trail is pretty steep and rugged and muddy and rocky anyways. I went about half a mile and up about 500′ through the snow, but you could stop any place along the way – it is all open and sunny and the view just gets better with every step. And even at my very slow pace I got to the ledge in just two and a half hours, making it a reasonable destination for lunch time. By the way, don’t forget your sunglasses (as I did). And the bugs are beginning to make an appearance. 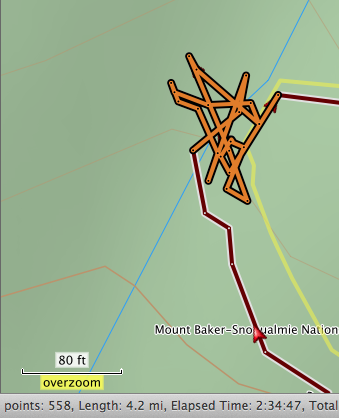 Since I won’t be able to make the hike on Thursday, I’ll give some directions for the part of the trip that is on snow. This is probably unnecessary since the boot track was very easy to follow and will surely get more traffic before Thursday. This gully is kind of gray and dirty-looking and it heads right up to the ledge. At this point you are back on the official trail. But you may recall that passes for a “trail” here is actual a steep slog over big rocks and up a creek – the current conditions are actually an improvement! 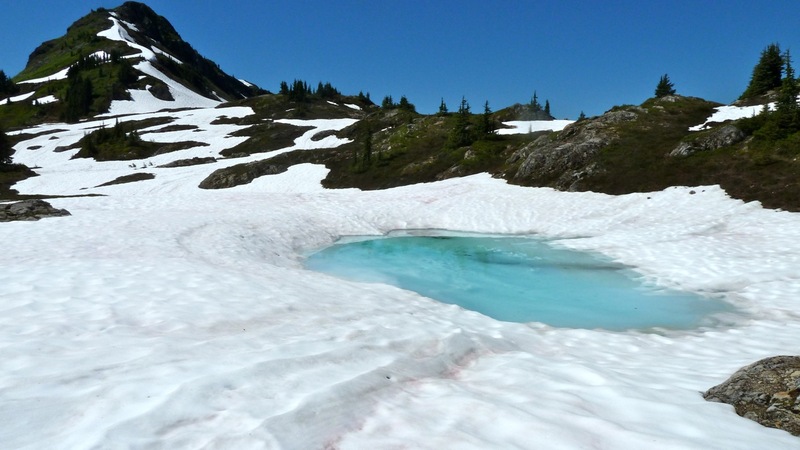 Of course you should keep in mind that there is a whole lot of melting going now right now – the most likely place to break through would be right down the center of the gully so you might want to keep to one side. I hope I didn’t make this sound more complicated than it is: you just head toward the notch and turn right at the gully. After the hike I drove up to Heather Meadows to assess the conditions there. 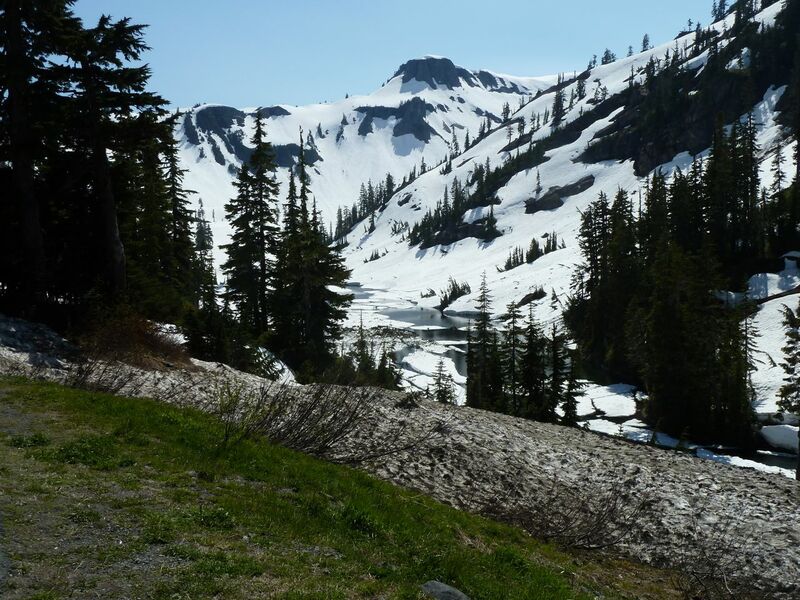 As you can see by this picture looking down in to Bagley Lakes from the parking lot by the winter gate, there is a lot of snow up there. 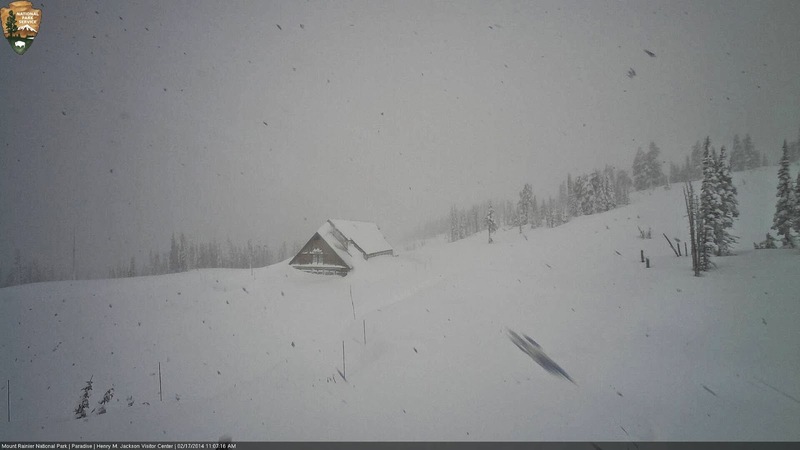 The DOT is determined to open the road to Artist Point but I’m not sure what good it will do – you will probably step out of your car and be faced with ten foot walls of snow! Yesterday I went with friends to check out the Excelsior Pass trail. I was a bit disappointed; the snow is melting very slowly there. We may just have to trade back and forth between Church and Goat for the next month or so. On the other hand, there is a lot of melting going on. Sigh. 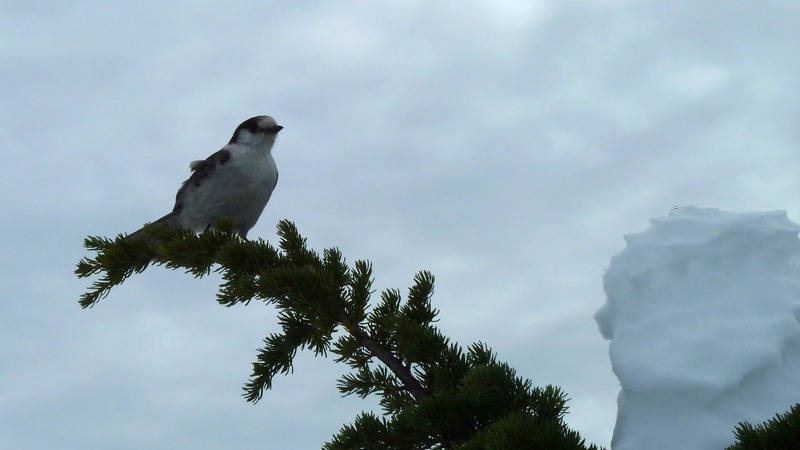 On Saturday Fred and I hiked up the Excelsior Pass Trail to get a close-up look at the snow conditions in the high country. 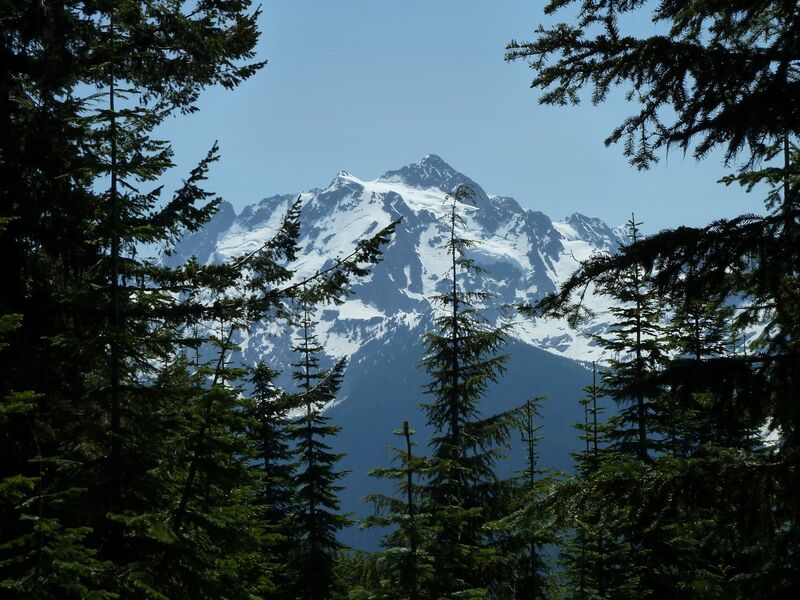 The good news is that there is some serious melting going on up there – early in the hike we could hear Nooksack Falls roaring through half a mile of dense forest. A bit further on that joyous noise was replaced by the roar of the stream that the trail follows toward the pass, and soon we came to the place I call The Flume, where the stream has completely stripped the soil from an almost artificially flat expanse of bedrock, forming a tempting water slide. It is always a lovely spot but it, too, was roaring more than usual. 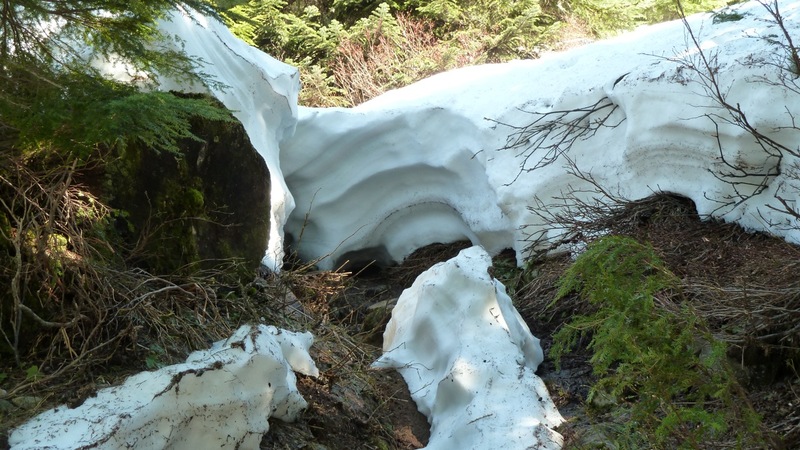 The bad news is that we ran into snow at about the same place we did last year, when the deep and lasting snowpack made a mess of the local hiking season. We saw the first dab of snow on the trail at about 3700′ of elevation and the snow patches grew across the trail soon thereafter. 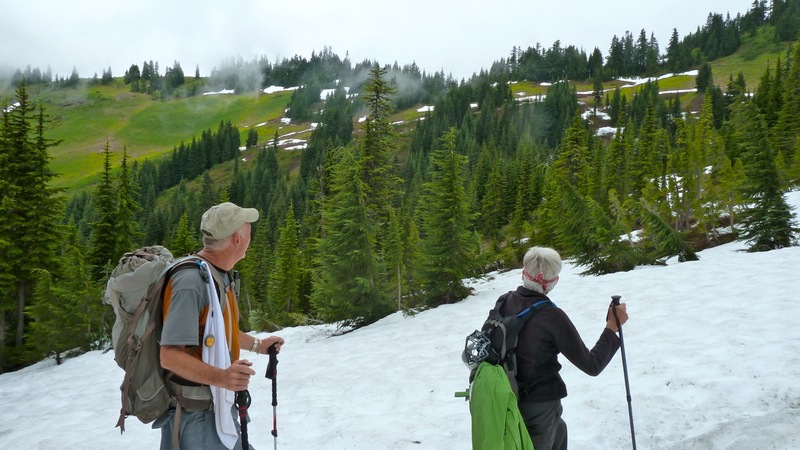 The snow in the picture on the left is very near the point on last year’s June 16th hike where DJan’s blog (click to view) shows me trying to blast my way trough a thin snow bridge. 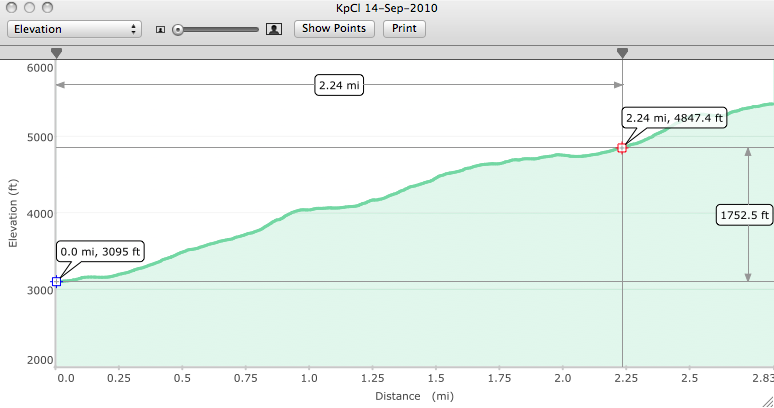 By the time we got to 4000′ the trail was completely buried – from then on we depended on instinct and a good GPS track (from last year’s first fully successful hike to the high country – on August 11!) to continue. We did pretty well at following the trail and continued on to about 4750′, a few hundred feet higher than on the June hike last year. But the only times we could be absolutely certain that we were still on the trail were when I punched through the snow into the cavern carved out by the meltwaters flowing along the trail. The snow was not deep enough for this so-called “postholing” to be dangerous, but it can be a bit disconcerting to be strolling along and all of a sudden be up to your unmentionables in firm, wet snow. 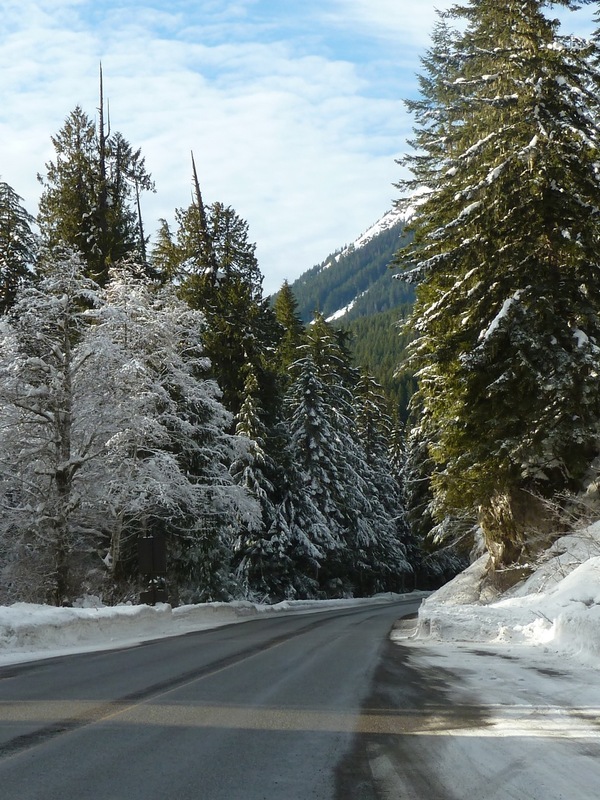 And all things considered, the North Cascade Highway experience seems to be an accurate omen – the DOT managed to open the highway this year two weeks earlier than last year and the snow depth gauges and yesterday’s hike all are running about two weeks ahead of last year. So it’s not likely to turn into an average snow year but with some reasonably warm weather it won’t be a complete mess. is that Fred is out hiking again. In addition to the misfortune of having a full-time job, he was slammed a few months ago with a flare-up of his rheumatoid arthritis, which had been dormant for decades. Unlike the more common osteoarthritis, which is largely a matter of wear-and-tear on aging joints, RA is a tricky auto-immune disorder – the body mistakes its own tissues for a foreign invader and rallies the considerable forces of the immune system to repel the insidious “invader.” It also shows up most commonly as swollen and painful joints, but in this case it sneakily avoided treatment by presenting as debilitating pain in his leg muscles. 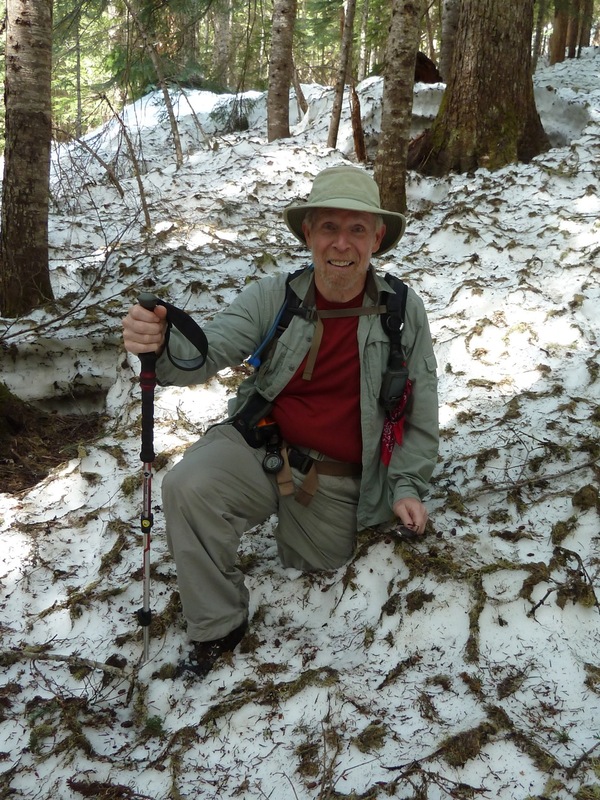 But a few weeks ago the situation was decoded and brought under control by some powerful modern medications – yesterday’s hike was Fred’s first serious outing (almost 8 miles and 3000′ of gain, 1000 of it in the snow) in some time and it went very well. This morning as I was sitting at my computer trying to avoid going to the gym, I recalled having a short conversation at my meeting last Sunday about Snotels. These are remote automated weather stations that have been built at various places in the mountains by the Natural Resources Conservation Service, an arm of the USDA (Department of Agriculture). I had run across them in the past while poking around on my favorite weather website Weather Underground, Inc, but I never knew if they were accurate or reliable – I knew they reported snow depth, for instance, but were they measuring the actual snow depth at the moment or the total amount that had fallen or the water equivalent or what? The man I spoke to at the American Alps meeting, a long-time employee at North Cascades National Park, was saying that they do measure actual snow depth as well as water content and are accurate enough that they are used by Seattle City Light, the Seattle utility that operates the three hydroelectric generating stations at the three big dams on the Skagit River along North Cascades Highway (SR 20). 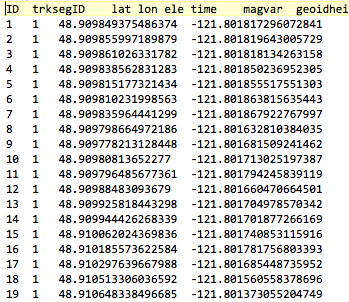 Anyways, the nice people at NRCS not only display current data and complete historical data for the entire lifetime of the snotel (10-20 years) in neat tables on your browser but they also package it in a machine-readable format (CSV) that can be imported into a spreadsheet application. Once there it can be manipulated and charted in all sorts of ways. 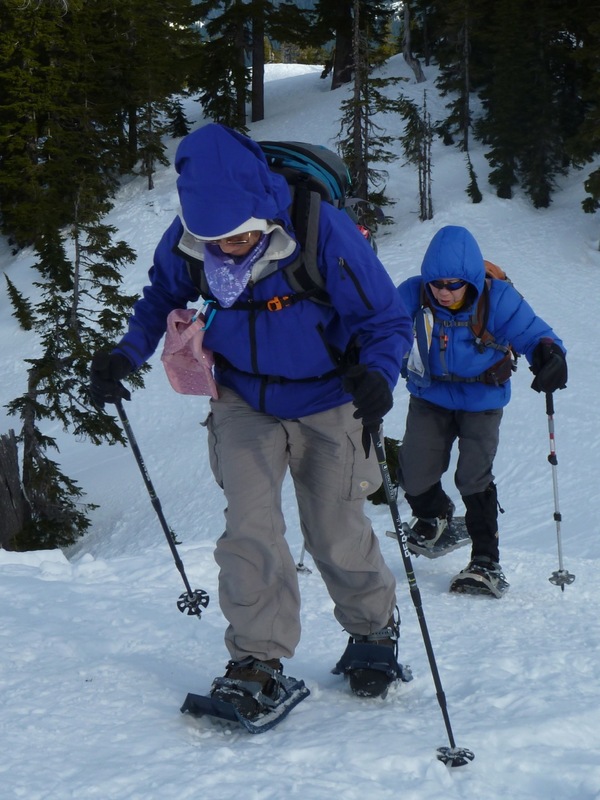 The motivation for this is that our hiking season was almost wiped out last year by the extraordinary La Nina snowfall. 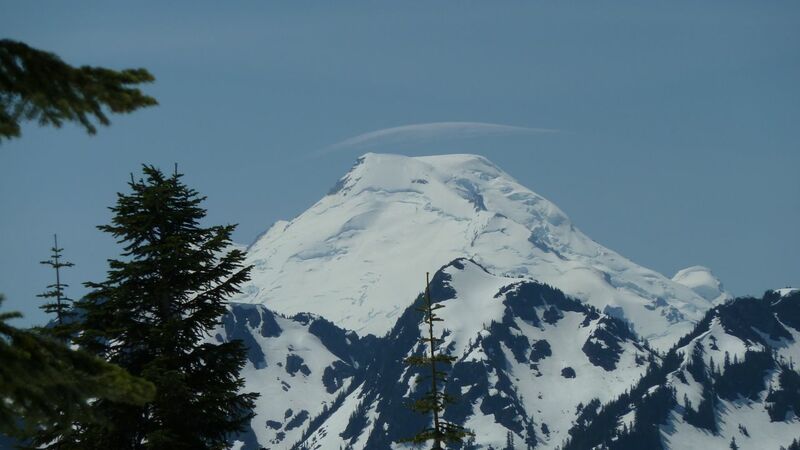 And we have now had a rare back-to-back La Nina this year, with near record snow depths at the Mount Baker Ski Area – great for skiers, not so much for hikers. We will be setting our July-September schedule in a few weeks and it would be nice to get an idea of when we can go where. 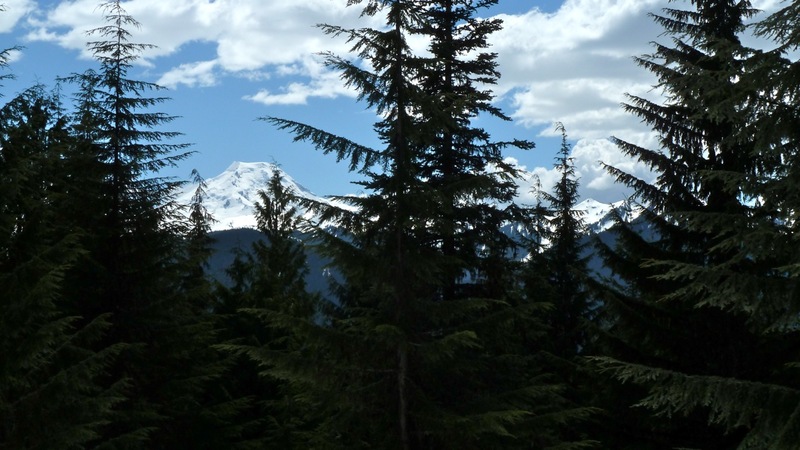 So the first thing I did was download the data for the last two years at the MF Nooksack and Wells Creek locations, which I chose because they are in the areas where we hike in the summer and are at the sort of elevations that we hope to reach – 4900 feet and 4030 feet, respectively. 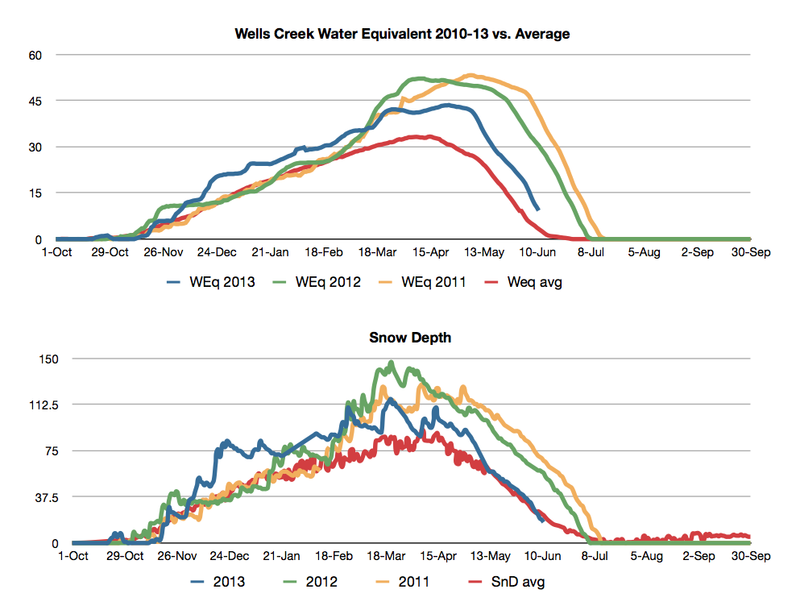 The black line (on all graphs) is the current “water year”, starting on October 1, 2011. The first thing that struck me on the MF chart is the flat-topped area where it seems to be bouncing off the 200 inch line – I suspected that this might be some sort of physical limitation on the equipment. But the WC chart shows a very similar shape (at a lower level, to go with the lower elevation) so I don’t think it is an artifact. Notice also how it tracks with our experience at sea level – it is almost flat in December (which was unusually dry) with barely enough new snow to keep up with the natural settling and compaction, and then takes off after the New Year, with a monster spike in Feb and Mar, which were especially wet in town, too. The encouraging thing is that the maximum snow depth was higher and earlier this year. Last year’s green line doesn’t peak until mid April and then hangs like Michael Jordan on a dunk well into May. I love the way this year’s line is already below last year’s – and the current warm sunny weather can’t hurt. 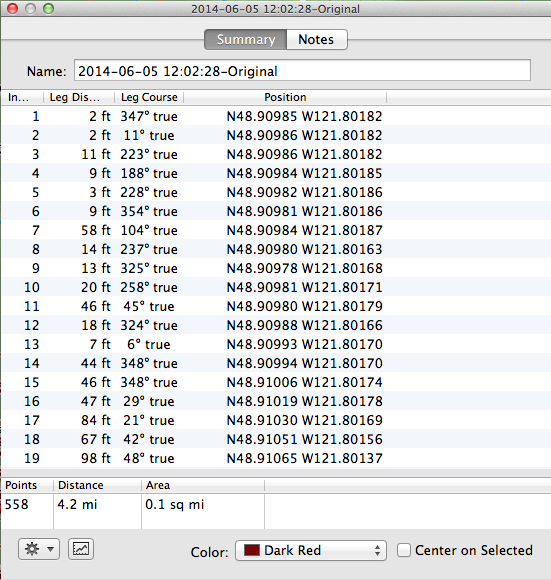 So I fetched the entire history of the MF Nooksack snotel which went into service on October 10, 2003. Most years had some missing data (and some had a lot) so I smoothed over most of them, except 2008 (purple) which had such huge gaps that it would just be wild guessing. 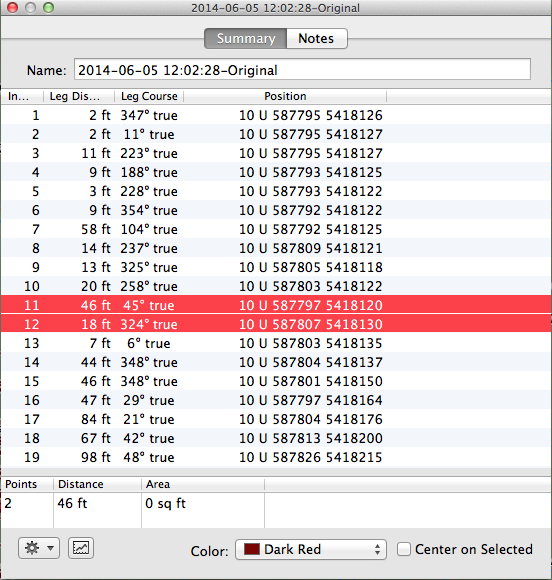 This was even more encouraging – with the exception of that big hump in March we are moving close to where all but two recent years are clumped together. So where’s the beef? We are still well above average but well below last year. 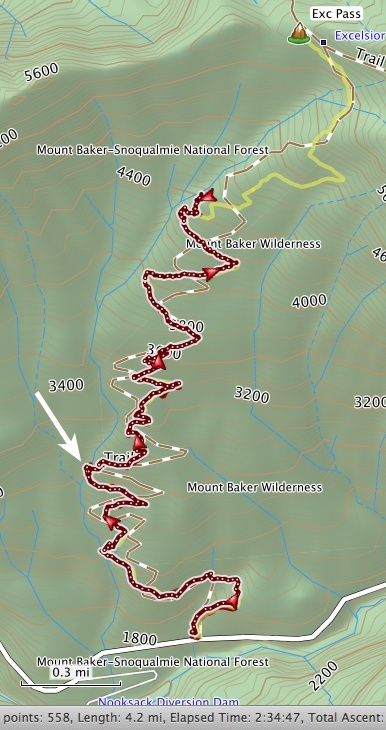 That little zag in the black line tracks with the damp, chilly weather which has been all too apparent on our recent hikes – without that we would be on a trajectory more likely to join the red line than the green one. 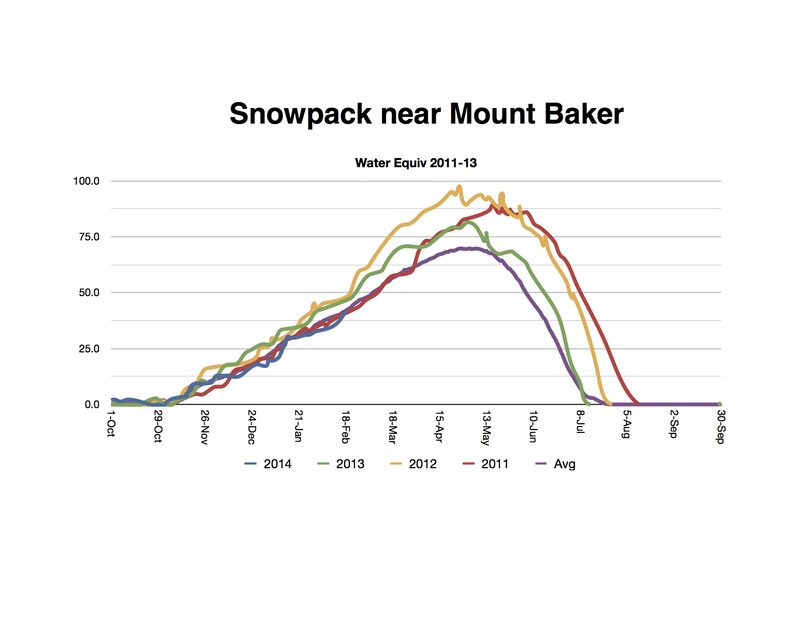 So I think it is not too late for some warm, clear weather to rescue this year’s summer hiking season.